A new “Limited Time Content” wrapper block for the WordPress 5+ / Gutenberg editor allows RSVPMaker to control the display of whatever blocks of content you place inside. You can set it to not display the content before the specified start date and time (for example, the start of a sale) or after the end date and time (the end of the sale). A promotion with an expiration date. You can provide a start date, an end date, or both. One of my motivations for creating RSVPMaker in the first place it that I think it looks bad for a website to be advertising an event that has gone past as if it were still in the future. The same is true for a an announcement that is long past its expiration date. The Limited Time Content block can be added to any blog page or post. You could use it inside an RSVPMaker event post as well (for example, to call attention to early bird event pricing that should no longer be advertised after a certain date). This wrapper component can be equally useful for staging content on your website that should not be advertised prior to a certain date or time. Examples might include the launch of a product or of a political campaign. 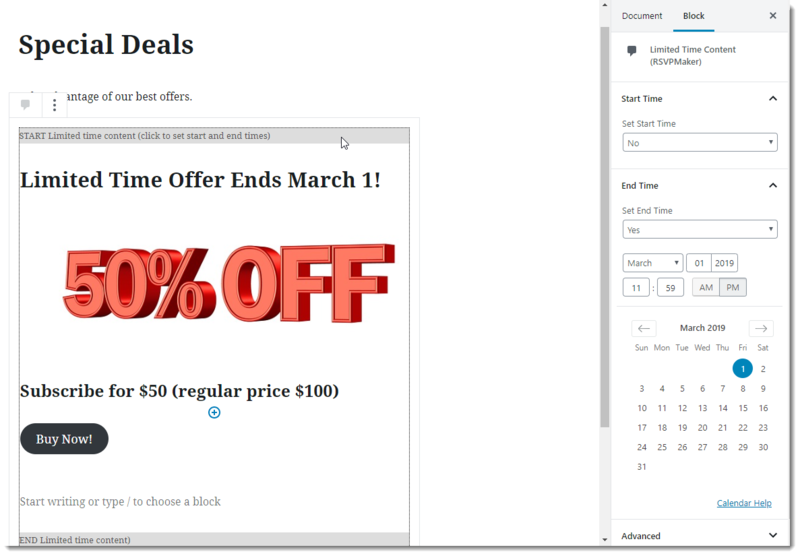 Because it’s set up using Gutenberg’s InnerBlocks, you can place paragraphs, headings, images, and other blocks of content inside the Limited Time wrapper. A shaded border makes it easier to see what content is inside, versus outside, the Limited Time area. Click on the border to set the start time and / or end time. Note that caching plugins could interfere with this component starting or ending the display of a block of content at precisely the start or end time you’ve specified — the logic of what content to display or not display only gets executed on a dynamic page load. Even if it works perfectly, you’ll want to go back and remove blocks of content that have expired, rather than leaving them in the body of a post indefinitely. Still, this should save time on the chore of adding and removing content intended to be displayed on you your site for only a limited time. Update: As of release 5.8.5, you can set RSVPMaker to automatically delete a block of content that has expired (passed the end date that you set). See related post.